What the what, you ask? This is (apparently because I can’t see if the headlights are rectangular or round) a 1976 Caprice Landau, to which has been added … T-tops. … a beautiful example of compromise. If you want the open-air fun of a convertible but don’t want to completely sacrifice structural rigidity and add the weight of a drop top, the T-Top was made for you. It’s also not a feature you’ll find in any car being manufactured today. Meaning if you want the red-jeans-wearing, mullet-having, John Cougar Mellencamp-blaring awesomeness of a T-Top, you’re more than likely going to need to buy a classic car. See those wheel covers? They turn with the wheels! While Tasco had an excellent roof, they never made more than one prototype of the car. The T-Top wasn’t seen again until GM introduced it on the 1968 Corvette, at which point Gordon Buehrig promptly sued them. While his suit was successful, the settlement is said to be relatively small. The Corvette’s T-Tops were so well-liked they were cited as the reason Chevy discontinued Corvette convertibles in the 1976 model year and didn’t resume production of them until 1986. What late C3 ‘Vette lacked in forward visibility and stingray badging, it completely made up for in roof-awesomeness. Perhaps the most iconic application of the T-Top was on the second-generation Pontiac Firebird. Offered for the first time in 1976, these T-Tops were originally provided by Hurst until 1978, when they were replaced by larger, less leaky panels manufactured by Fisher. The “Smokey and The Bandit” Trans Am, pictured above, features Hurst tops. Eventually, all of the Big Three American car manufacturers tried their hands at making cars with T-Tops. They even made their way onto less performance-oriented models like the Chrysler Cordoba and seventh-generation Ford Thunderbird. Overseas, this roof is featured on a variety of Japanese and British automobiles, even on quirky utility vehicles like the Subaru Brat and Suzuki X-90 (you may not recognize it without a giant Red Bull can on the back). While none of today’s car companies have the good sense to make cars with these truly awesome roofs anymore, the Chevy Camaro and Pontiac Firebird brought the T-Top into the 21st century, if only just. T-Tops went the way of Pontiac and its Firebird in 2002. Until manufacturers come to their senses, car-buyers with discriminating tastes, i.e. those who adore T-Tops, will just have to look to classic cars to get their open-air performance fix. And that’s just fine by us! 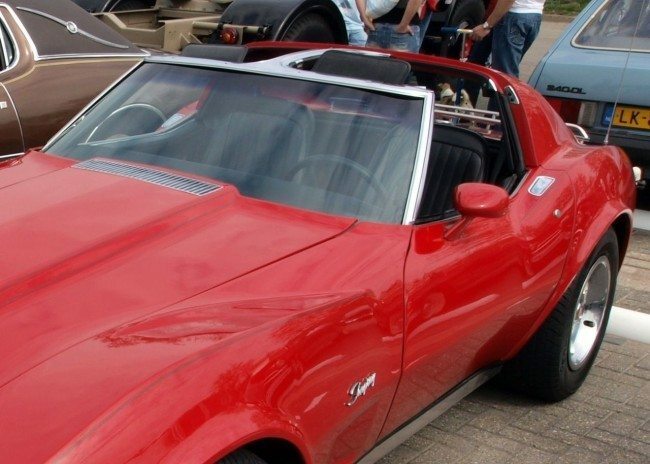 The T-top was only on the C3 Corvette, replaced on C4s thereafter by a targa top, which covers between the top of the windshield and the B-pillar. The bar between hatch panels was because merely cutting off the roof would have made the car unstable. Stiffening from the C4 onward (the C5 was designed as a convertible to which the roof was added) helped deal with that problem. … a power T-top. This is the only one American Sunroof Corp. built for Olds, because they couldn’t get the power top mechanism to work. (Imagine GM rejecting new technology because it didn’t work right.) Olds instead sold the Toronado XS, which had merely a sunroof. The most desirable of the big Chevrolet B-bodies (the Chevy Impala and Caprice, Pontiac Bonneville and Grand Ville, Olds Delta 88 and Buick LeSabre) are the convertibles. (As are the pre-1971 Cadillac Coupe de Ville and the post-’70 Eldorados.) Targa tops and T-tops are the next best thing. Convertibles today are either sports cars (ranging from the Corvette to the Mazda Miata) or otherwise small cars (the late Chrysler Sebring). Detroit doesn’t make big cars anymore, so Detroit doesn’t make big two-doors, let alone big convertibles. Chevy ingenuity, or cheapness: The 1974 Spirit of America Impala, with special wheels taken from pickup trucks of the era. 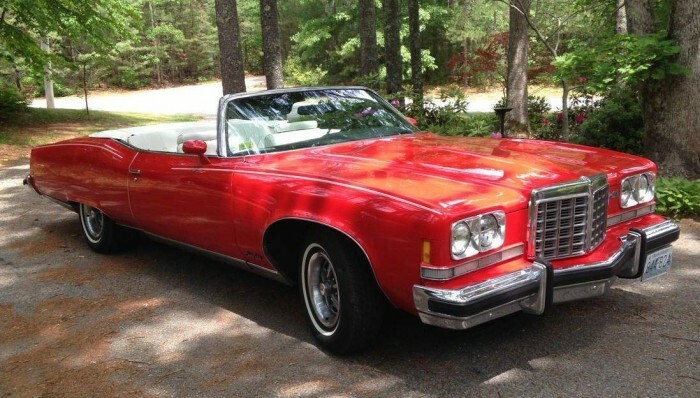 1974 Pontiac Grand Ville convertible with Rally II wheels. … or Buick, though not, for some reason, the big Olds. 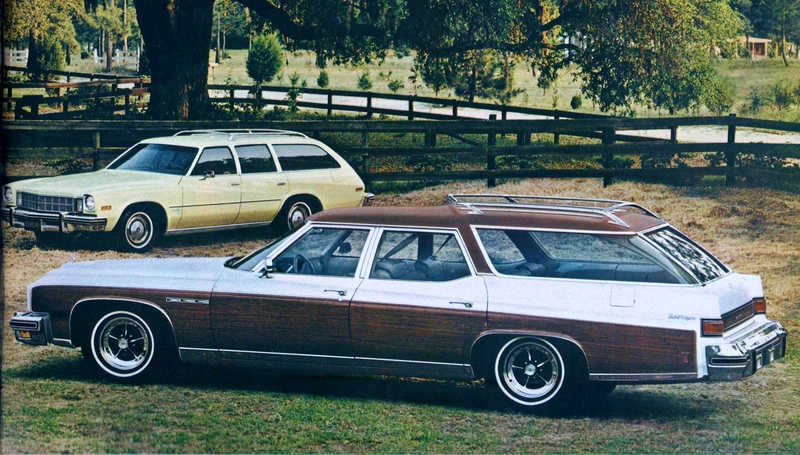 In the foreground is a 1974 Buick Estate Wagon, which has vinyl roof and woodgrain AND Buick styled road wheels. The B-bodies (built at Chevy’s late Janesville plant, by the way) were designed thusly for 1971. (The C-bodies — the Olds 98, Buick Electra and Cadillac Coupe and Sedan de Ville — were even bigger; “C” probably stood for “colossal.”) The ’71–76 Chevys model offerings did not include the Impala SS, combining both size and horsepower from 1961 to 1969. The Impala SS’ death is too bad given that Chevy could have put together a ’71–76 Impala SS from its own parts bin, using, for instance, its 454 V-8 and the swivel bucket seats and console of the mid-’70s Monte Carlo and Laguna S-3. Of course, someone “restomodding” a big Chevy could do that too, as long as you’ve already departed from originality with your T-top.